The Cape Cod town of Eastham's main attractions are a historic windmill, a museum, and the Salt Pond Visitor Center of the Cape Cod National Seashore. Right across the street from the Salt Pond Visitor Center is the quaint and attractive Eastham Historical Society Museum (map). Look for the curious gateway, made from the jawbones of a huge whale. The museum, once a schoolhouse, dates from 1869. 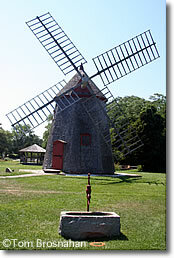 Just south of the Salt Pond Visitor Center on other (est) side of US 6 is the oldest windmill on Cape Cod (1793) in a pretty park. It's a favorite place to stop and take a photo, throw a frisbee, or enjoy a picnic. From the windmill, take a side trip west to First Encounter Beach, where the Pilgrims first met the Indian inhabitants of Cape Cod back in 1620. A plaque on a boulder up the hill just north of the parking lot commemorates the meeting, which apparently was anything but cordial. You can visit the boulder plaque for free, but if you want to park and swim and use the beach during the summer, you'll have to pay the town's beach-use parking fee. the oldest on Cape Cod.